Most certainly the big news of the week was our little girl turning 13 years old on Monday! As impossible as it seems she grew into a teenager. We all knew this day would come, but always hoped it would stay far off in the future. Not surprisingly, her dad isn't taking this well. Her birthday is not usually a happy time of year for him since it marks his baby girl growing a year older and a year closer to being all grown up. Given Amber's recent and seemingly permanent flare, we decided that a low key birthday would be best. She slept as long as needed then readied herself for a trip to the mall to visit Build-a-bear. For most of our time in the store we were the only ones there. Amber acquired two new stuffed animals and then we were off to meet Grandma for lunch. It was a slow day in that we were not rushed in any way. Shopping was slow, while lunch was leisurely and quite relaxing. Amber did walk through the mall to the store, yet when we popped into Target on our way home she needed to use the motorized cart. Birthday girl with her new stuffed animals and homemade red velvet cake. The rest of her birthday was spent playing the Disney Infinity with me, opening presents after Fred finished work, and eating a birthday dinner at home. We broke with our birthday dinner restaurant tradition for the very first time. Dinner at our usual special event restaurant would have required reservations, a half hour drive, anxiety over noise levels, anxiety over Fred making the time I had selected, worry about food preparation, and the exhaustion after dinner. Instead we let Amber choose the menu for her birthday dinner: lemon herb chicken, Rosemary rice, potato smiles, decaf iced tea, and of course birthday cake with ice cream. It wasn't a very balanced meal, however it was her favorites. I even got out the china and we ate in that extra room at the front of the house, aka the dining room (gasp). More birthday pictures. Plus the apron Amber decorated at her party with cake box label. Tuesday, despite our precautions, Amber crashed hard and missed a planned get together with a friend. Amber really never made it out of bed. Well, ok yes, she did get up off the bed occasionally, but it always resulted in dizziness, black spots in her vision, an instant worsening of her headache, and worsening tachycardia since she had tachycardia all day. Of course it was also my scheduled day to send an update to Amber's neurologist with vitals and details of how the new medicine is working. A few hours after my email was sent the neurologist, himself, called me to explain his concerns and his reasoning for adding another medication. We had already discussed this possibility at the last appointment, so I was was not totally thrown off guard. What is disconcerting is the way he speaks as if Amber already has a firm diagnosis of AAG. He appears to be treating her as if that is the case. Of course, we are still waiting for that antibody blood test result. It's the story of our life right now. Wednesday Amber made it out of bed and seemed to have recovered some of her energy and more importantly her heart wasn't as crazy. However, I made the mistake of thinking her normal flute lesson would pose no problem. By the time her lesson was over it was clear Amber could not make confirmation class in the evening. 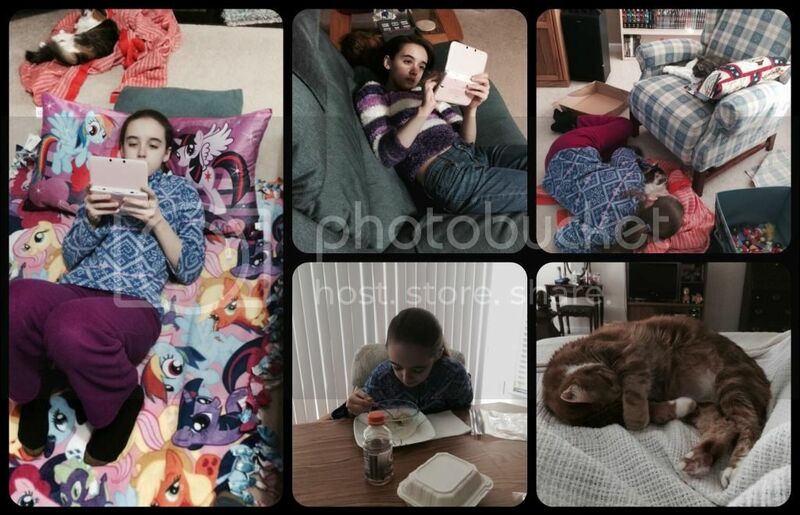 I called in our absence, put Amber in a supine position again, and took more calls from multiple doctors. Now we are figuring out the make-up for the missed confirmation lesson, but our church and the pastors could not be more understanding and supportive. The various ways a crash looks. And an adorable kitty who won't leave Amber's side when she's sick. Amber was determined to make it to co-op on Thursday because not only did she have a cute "birthday at co-op" outfit planned, and her friends were all going to be there, but it was also audition day in drama class. The teen drama class is working on The Lion, the Witch, and the Wardrobe this semester. Amber has wanted the part of Susan since she found out about the selected play back in the summer. However, Amber is a peacemaker and when her friends show interest in a part Amber also wants, she just backs away and picks a different part. Amber was down to almost no possible part a few weeks ago when I had a talk with her. We talked about it being alright to try out for a part if she wants it. None of her friends were backing away from parts Amber mentioned. They are great kids and I'd like to give them the benefit of the doubt, but sometimes it seems like they know Amber will back down and take advantage of that. Still, Amber and I discussed that the key is to be kind, gracious, and supportive during the auditions and after the parts are announced - no matter what part you are assigned. Amber was up against 3 other friends and could hardly stand the situation, but she persevered and was awarded her first choice part of Susan. She would have been happy with Mrs. Beaver, but is thrilled with Susan. She couldn't stop beaming about it and about all the great parts her friends were assigned too. She commensurated with a friend who got her last choice part and another friend who only had one part she wanted and unfortunately Amber received it. Birthday co-op outfit, and waiting at the allergist on our way to co-op. 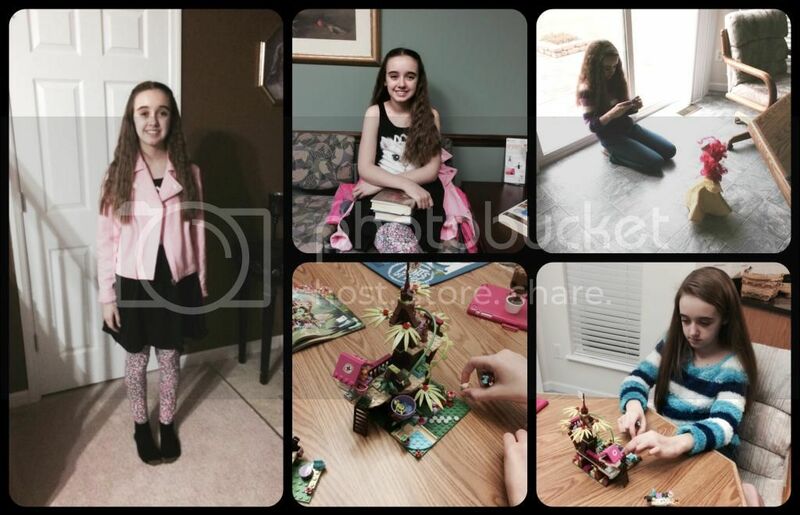 Working on her photography art homework, and building a new LEGO birthday set. 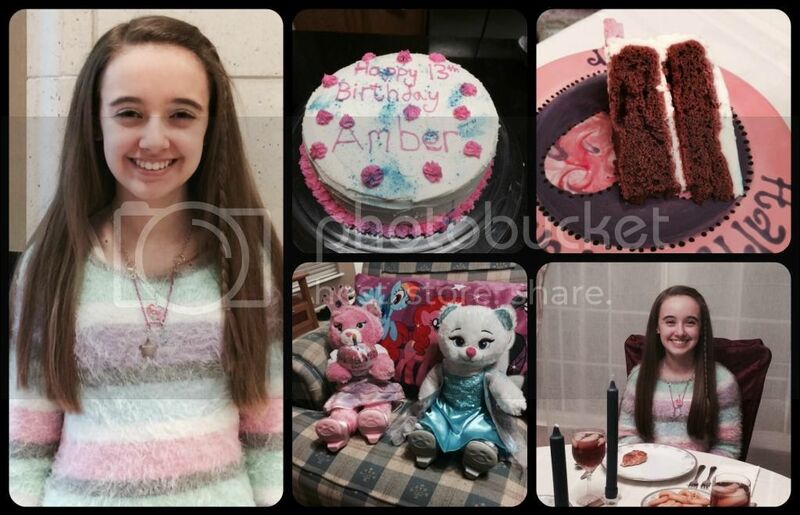 Today was Amber's birthday party with just a few close friends (all of whom are in the drama class). It was a simple party based on one Amber had when she was younger. 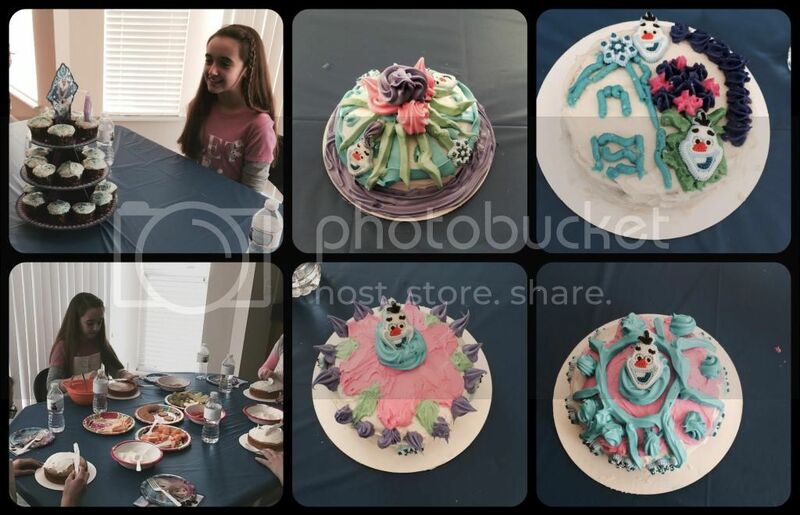 Just cake decorating fun with Frozen themed icing colors and accessories. 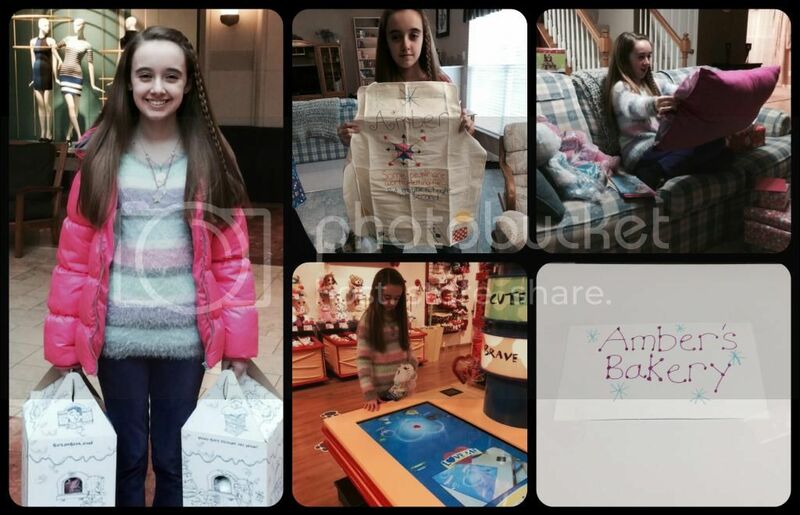 Mostly it was a time for the girls to get together and do something calm yet fun in honor of Amber's birthday. This is probably the most low key birthday party we've ever had, yet Amber has been just as excited for it as any of her huge parties. It really isn't the quantity of friends, but the quality. School-wise (did you think we'd never get to this part?) we have still officially been on a Winter break. Amber has been watching her CNN student news each day, practicing her flute, working on confirmation homework, playing her Professor Layton 3DS logic games (of which she got 2 more for her birthday), writing Christmas thank you letters (I'm an old fashioned stickler about this), reading a lot of young adult fiction (fantasy mostly), helping me plan the project for my co-op 50 states class, working on her photography art class homework, and helping to research midodrine (her new medication). Birthday party fun! Top right cake is Amber's very busy creation. She chose to draw a scene of some kind. Her friends chose to make patterns. It's all in their personality. Next week we formally start back with book work in limited subjects each day while gearing up to full time school by the end of January. We've also been chosen for a couple of reviews as part of the Review Crew, which means we have some new curriculum to try out and play with. School is always more fun when you are starting something new. This weekend we have nothing scheduled, hallelujah. I have some paperwork around the house that needs to be filed and just random stuff to do. Amber needs to rest up and be prepared for 2 subjects of school on Monday. We still do thank you notes the old fashioned way. I am glad Amber had such lovely birthday events. I think you are doing a wonderful job balancing her life and giving her enough rest. Good Job! I really am sorry that you and Amber have to go through all of this. It must be very worrying for you all. But what a lovely young lady she is becoming. I'll bet you are so proud of her. Happy birthday Amber and well done for getting the part in the play!